A man arrested on suspicion of planning a terrorist attack in London on Thursday was on the Mavi Marmara ship, which was raided by Israeli soldiers in 2010 while trying to violate Israel’s naval blockade of Gaza, sources familiar with the investigation told Reuters on Friday. 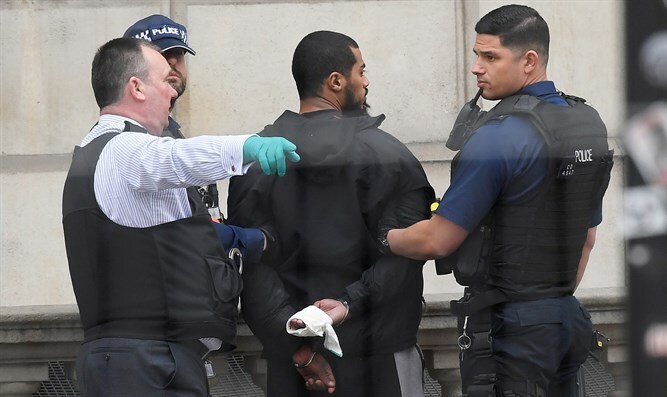 The 27-year-old man was arrested with knives near Prime Minister Theresa May's office by armed counter-terrorism officers during a stop-and-search as part of an ongoing security operation, British police said. He remains in custody on suspicion of terrorism offences and possession of an offensive weapon, according to Reuters. Sources who spoke to the news agency on Friday identified the suspect as Khalid Omar Ali from London. Ali was on board the Mavi Marmara, the sources, speaking on condition of anonymity, said. However, one source close to the current investigation told Reuters that investigators believed that Ali's involvement in the boat protest was entirely separate from whatever might have led up to Thursday's incident. The Mavi Marmara incident occurred when IDF soldiers boarded the ship after the Islamists on board, who claimed they were carrying humanitarian aid for Gaza, refused to reverse course and dock at the Ashdod Port. As soon as they boarded the ship, the soldiers were attacked by the Islamists with clubs and knives, forcing the troops to open fire and killing 10 of those on board. Upon inspection it was discovered that there was no humanitarian aid whatsoever aboard the Marmara. After the raid Turkey angrily cut off ties with Israel. As part of a reconciliation agreement with Turkey last June, Israel paid $20 million in compensation for the Marmara incident. In December, a court in Istanbul dropped a case against four top former Israeli commanders who were being tried in absentia over the Marmara raid.